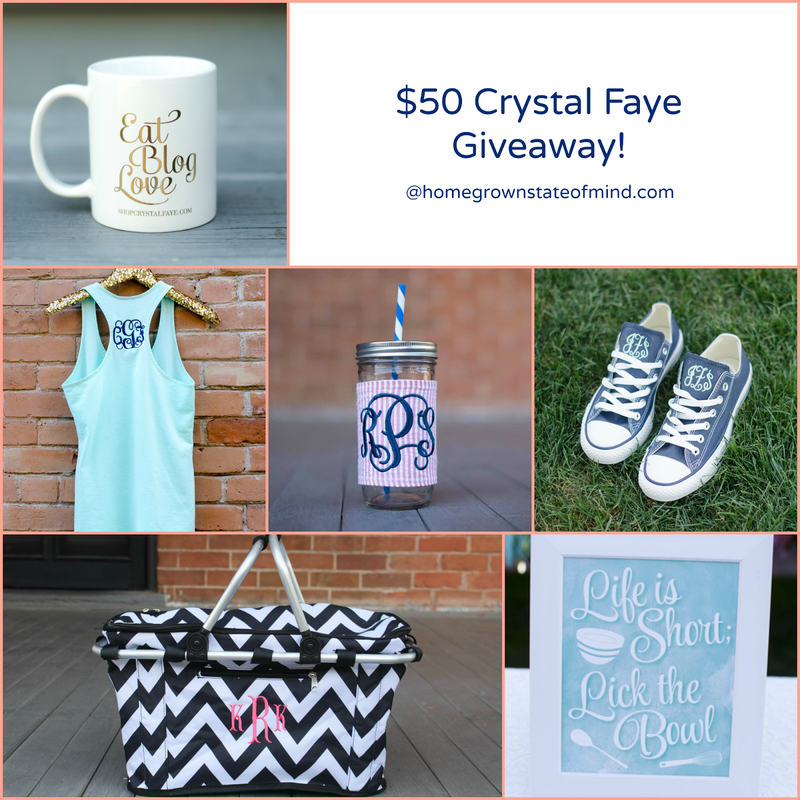 Homegrown State of Mind: Blogiversary + Crystal Faye Giveaway! Tomorrow will be my one-month blogiversary! I've been overwhelmed with such warmth and love from the blog community and am so very thankful for every single follower I have! I'm also very blessed to have connected with so many wonderful ladies through my blog. So, in honor of all of that, I thought a giveaway would show my appreciation for YOU! Enter the Rafflecopter giveaway below to win a $50 Gift Card to Crystal Faye! Ever shopped at Crystal Faye? I mentioned in this post that I recently got a "Eat, Blog, Love" mug from Crystal Faye and LOVE it! But the online shop has so many other cute products, too, such as monogrammed everything, frame-worthy paper art, and essential accessories. This giveaway will run until July 9th! So spread the word and tell everyone to enter!! Happy 1 month blogversary! Had to enter this giveaway because you know I love that mug, and anything monogrammed :) Looking forward to stalking you on Pinterest! Happy 1 month!! Well, if I hadn't already got the mug I'd pick that, but since I have it those monogrammed Converse are so cute! I really like the coffee mugs. Maybe the Tickled Pick one. What a lovely giveaway! I especially love the basket! I love that mug! I will buy that! I would get the Monogram Racer-Back Tank Top. Oh my goodness I am SUCH a huge Crystal Faye fan, but I still haven't actually bought anything! I'd definitely want to get my hands on a mug (either Eat Blog Love, or Oh Happy Day), and then maybe either a hat or pullover?! Too much cuteness! Happy one month! I would buy the half pull over monogrammed jacket if I won! that is so cute! Totally love the chevron basket! Happy 1 month! Oh I love everything!! A southern girl can never have too many things monogrammed!! I love the mason jars and racerback tanks. I'm not sure exactly what I'd get, something monogrammed for sure. That tote you have is super cute, or maybe a koozie! Great giveaway Julie, I'm crossing my fingers! I have been seeing that mug everywhere and I want it!! I'd end up buying so much stuff! Oh my gosh that cup though... so great!! I must get it even if I don't win! I would buy gifts for my bridal party, I love the cups and shirts! I would love to get the Oh Happy Day coffee mug! I'd get some coffee mugs! I would love the Seersucker Monogram Mason Jar. Very cute! The basket or the coffee would are so wonderful!! So pretty! I'd totally get the eat blog love mug- I've wanted one forever! I have the mug already but I would love to see what else there is!